Marvin has a pet dog and he likes to read stories about dogs too. The other day he found a very interesting story about a dog in a magazine that he was reading. 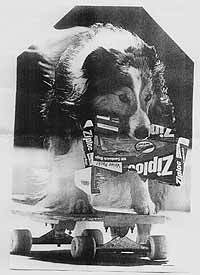 This dog was called Bingo and lives in the USA where he likes to zoom around town on his skateboard picking up bits of trash. Then he dumps the trash into a recycling bin and goes off to look for more trash. Have a look at the picture! Marvin thought that it would be a good idea if his dog could do this too, so he has been trying to train him. He is finding it very difficult to do! 1. What do you get if you cross a cocker spaniel, poodle and a rooster? 2. Why did the dog say meow meow? 3. What kind of races do female horses run in? 4. What do you call a dead fish? Apinya Songrungruang, manager of the Chiangmai Ballet Academy said the academy’s director ML Preeyapun Sridhavat has signed an agreement towards academic cooperation with Sharon Martin of the Dance Technique Institute, Australia and Masako Hirata from the Bangkok City Ballet. Staff and training instructors hosted a welcome party for Sharon Martin (with flowers, next to ML Preeyapun Sridhavat). The cooperation includes the exchange of dancing instructors, trainers, and exchanging information on the newest dancing techniques for further skills and knowledge development. At present, the Dance Technique Institute has Principal Sharon Martin taking part in teaching and training the trainers of the Chiang Mai Ballet Academy for every class level for three months. The academy’s students are eager to gain more experience and learn extensive techniques with up-to-date knowledge. As part of the exchange, ML Preeyapun has been invited as guest speaker at the Bangkok City Ballet and will also be a guest speaker for the exchange program with the Dance Techniques Institute on special occasions. A student exchange program is also planned. Students from Chiang Mai Academy will stay with hosts abroad, to take short courses on ballet dance training outside Thailand. Apinya added that this is a chance for Chiang Mai children and teenagers to gain knowledge to an international standard with qualified trainers in different fields of the art of dancing. Ajarn Santi gave the second lecture on music appreciation, to prepare his students for the upcoming annual concert at the American University Alumni (AUA) on Saturday, February 21, where the children and teenagers will be performing live on stage for the music lovers of Chiang Mai. The program will include piano, violin, guitar, voice and even a performance on Chinese harp. Ajarn Santi prepares his students for their February 21 concert at AUA. Parents, friends, teachers, and people interested in music are most welcome. The AUA is located on Rajadamnern Road. More information can be obtained directly at 09 852 7506. While grade 5 to 10 went on a field trip last week, the younger students at the Christian German School Chiangmai (CDSC) stayed on the compound and enjoyed the annual “Activity Week”. This became an instrument with bells and rattles at the end. This year the primary school teachers at CDSC worked together with the students on a project around the “senses”. The children worked in small groups mixed with students from different classes and within a week they had build a little experience park in the school. Children and parents try out the path. At the end of the week the parents were invited to a visit and were surprised with sounds, visual illusions and a walking path, filled with different materials. At one time the children could try out their smelling and tasting sense by guessing 10 different food and beverage items, which turned out not so easy once the food was blended or changed from it’s original look. The first stage of building the walking path. It was a week when the students could practice various skills and everybody was impressed by the result, including the children. Part of “experiencing the senses” was also a one-day trip to Mae Sa Waterfall where everybody had fun exploring the (rather cool) water. And who doesn’t remember how good it feels having those feet in the water and feeling the sand and mud between the toes? Nakorn Payap International School (NIS) held its annual International Day celebration Jan. 30, when students from kindergarten through grade 12 decorated booths, prepared food and costumes and gave performances representing their respective “adopted” countries. Some 12 different countries from South America, Europe and Asia were depicted with booths inside the new school cafeteria. Performances were held outside on a stage surrounded by a large awning. After performances ended at noon, the food sampling began with parents and students enjoying a wide range of culinary delights. Getting ready for ancient Thai boxing.